The digital world offers a glittering promise of ubiquitous connectlVlty, with friends, entertainment and information at our fingertips. It is not surprising that young people are choosing the online environment as a principal mechanism for socialising, communicating and exploring. Conversely though, we are told that the internet is a very dangerous place, particularly for the young. A dominant focus of contemporary political and academic investigation relates to the risk perspective of children and young adults using the internet. The goal of this chapter is to question the moral panics that surround social networking and online technologies and to present a more considered and balanced perspective. 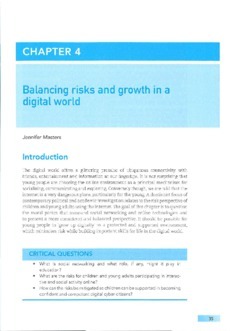 It should be possible for young people to 'grow up digitally' in a protected and supported environment, which minimises risk while building important skills for life in the digital world.